Marcelline E. "Marty" (Evans) Massey, 85, of Springfield, Ohio peacefully departed this life on Wednesday, October 10, 2018 at Oakwood Village. She was born May 4, 1933 in Springfield, Ohio to the late Madeline (McMichael) and Elbert Evans. Marcelline, lovingly called Ma Marty, received great joy spending time with her family and friends. She spent most of her life caring for others giving them the gift of her love. Those who were fortunate to enter her home and be in her presence, couldn't help but be in a place of peace and comfort. Marcelline leaves to cherish her memory three daughters, Linda Dixon, Jaynie Holt and Cheryl Massey; nine grandchildren, Breck (Danny) Massey, Terri Parks, Tarik Cameron, Craig Massey, Marlon Massey, Da'wan Dixon, Ryan Massey, Marci Massey and Monique Massey, 26 great grandchildren and 4 great-great grandchildren; two brothers, William "Billy" (Annette) Evans and Vernon "Tiny" (Tracy) Evans and numerous nephews, nieces, other family and friends. 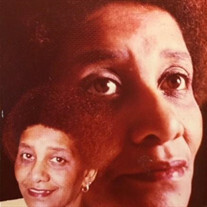 She was preceded in death by her daughter, Bonnie Massey; grandson, Briant Parks; sister, Georgianna Whittington; brothers, Elbert (Trimble) Evans Jr., Paul Eugene Evans and Alonzo "Zote" Evans.